My husband and I live in Minesing, we have been married for 7 years and unexplainably “infertile” for 6 of those years. We tried to conceive for a few years with no success, then my extreme impatience led us to quickly pursue adoption. We felt strongly that if we weren’t able to conceive then we would adopt. Our biggest dream was that we would become parents and it was ok with us if we weren’t biological parents. When we were “tested” after our official year of trying, we were told that everything was fine (right) but we felt strongly that we didn’t want to wait any longer without moving forward with the adoption process. If God allowed us to become pregnant, we could always stop the process. Fast forward 6 years and we have never seen two pink lines on a test. The adoption process wasn’t easy but it made me feel like I was able to move our situation forward by filling out some paper work or making a phone call. Adoption brought us on a whole other emotional rollercoaster but in the end it was so worth it. We now have two beautiful, miracle adopted children that we were able to bring home from birth. They are now 3.5 yrs and 1.5 yrs. We also have a teenage foster daughter that recently joined our family. We gave up control of building our family a long time ago and we are grateful to receive the children that God brings to us. 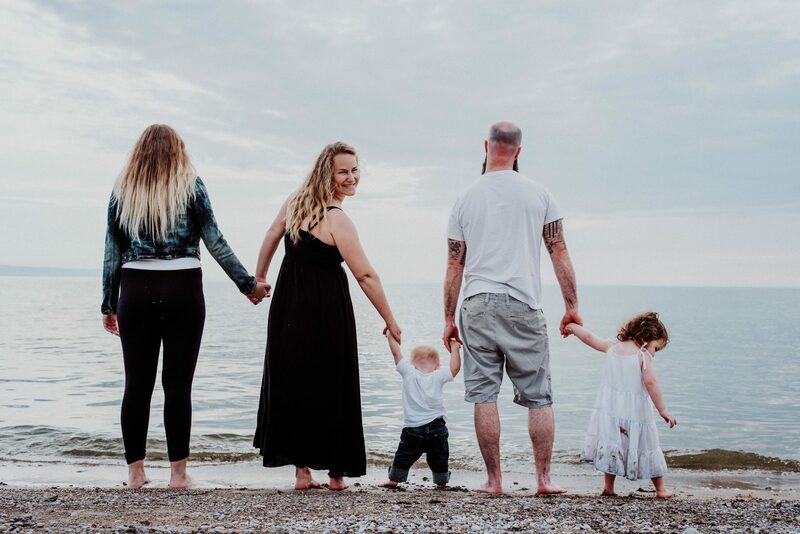 We have open adoptions with our children and it has opened our eyes to what a beautiful thing it can be when two families come together through their love for a child. There is a mutual gratitude for the gift that we have both received in different ways. We always prayed that through our difficult situation, we would be a blessing to someone else. We now also get to love on our birth families, who have had a broken road lead them to placing their child for adoption. I was inspired to start Hope for Waiting Arms to provide encouragement, resources and support to women who are struggling with infertility and the family-building challenges that follow. I found that all of the specialists that we dealt with to be great in their designation but everywhere we turned seemed to be lacking in emotional support. I started to feel sorry for my husband that he was the only person I had to lean on, and that he had to see me cry SO often. I hope this community helps to fill that need for support. We need each other when we are going through this. We need to surround ourself with people who get it, people who have been there and have persevered to build families. I found the blog to be a great way to share the resources, our adoption experience and encouraging articles that I found on our path to parenthood. The blog is great but I still felt that there was a need for a more tangible support. I started to meet people that were also struggling in this area and thought that it would be better if we could all be there for each other and not just pass on my own experience. Our In person support group “Waiting Arms Community” was started November 2017 and is held in Midhurst once a month. It has grown quickly in the last 6 months. We get together and share our experiences, our ups, our downs and everything we are learning along the way. This fall we are hosting our first Fertility Wellness Retreat in Muskoka. We have an amazing weekend planned, full of fertility resources, professionals in the naturopathic and counselling industry, a fertility focused menu, workshops, coping strategies and guests who are sharing stories of hope. Its going to be incredible and there are a few spots left. If you are interested in coming, click here to visit our website for more information. We are also launching our newest group this fall, Adoption Play Group which will be a place for adoptive families and anyone interested in adoption to share about the process, openness, raising adopted children and anything else that comes up related to adoption. I hope that in some way Hope for Waiting Arms can support you on your journey to becoming a parent. I’m so sorry that you are here, but I’m glad you found us.